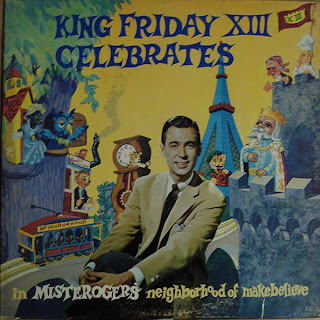 But for no apparent reason, one track floated through my mental transom every few months—under the guise of chipmunk fellow Cornflake S. Pecially, Fred Rogers himself sings "Looking for a Friend." I'd occasionally be curious to hear it again, but the album was light years beyond out of print, barely mentioned on the Internet. But it was only a matter of time. A couple months ago, the song came to mind again, I fired up the Google machine, I found this page, and seconds later, I'd downloaded the whole album (as you can do yourself), and I finally heard "Looking for a Friend" again. I repeat: The Internet is magic. I'm also amused by that other tune, "Three Rodents with Defective Eyesight." See, I thought I'd independently invented the concept for the Pop Music Thesaurus and the Movie Quote Thesaurus, but apparently it was Mister Rogers' influence all along. I enjoy how this post follows your piece on overused idioms of the '00s, because coincidentally, I can't *stand* the phrase "[blank] is magic." The technology of the internet* isn't "magic", it's "magical"! Grr. * I also refuse to capitalize "internet". It's a conceptual place, like "heaven" & "utopia", not a location like "Scranton" & "The New World".